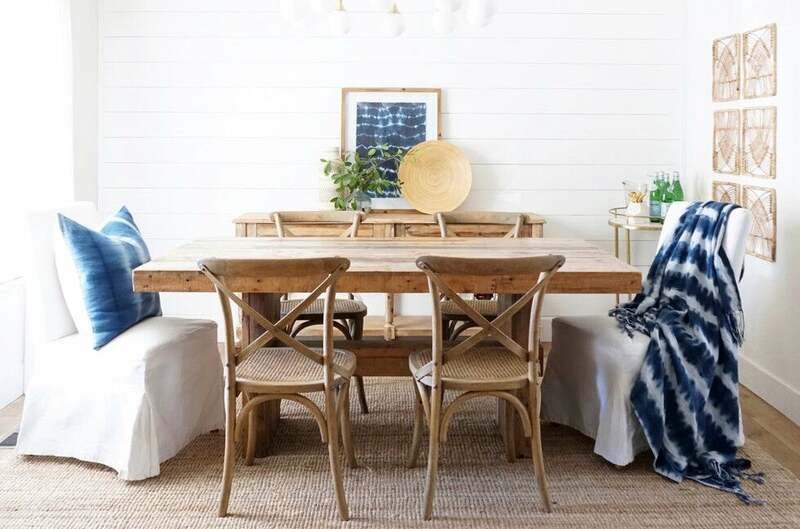 Modern meets boho in this gorgeous ranch house. From looking at the pristine interior of this whitewashed California home, you probably wouldn’t guess that there are four kids that live here. Yet somehow, Alma Arietta was able to blend functionality with style to create the home of (most of) her dreams—and her one trick for doing so? Arrieta is the creator and blogger at Almafied.com, though fans of the laid back California cool vibe she has expertly curated may likely recognize her from her Instagram. Since moving in to her 2,300-square-foot home two years ago, she’s been tackling the renovation process gradually; and while, in her own words, there’s still work to be done (the exterior is the next project), a lot has changed in those two short years. They also got rid of some ’70s-style half-walls sectioning off the entryway from the rest of the home, renovated the kitchen, removed popcorn ceilings, laid new oak laminate flooring throughout the living spaces, and completely remodeled the fireplace. In other words, this isn’t your basic add-some-new-pillows, slap-on-a-new-coat-of-paint project. It’s truly been a labor of love for Arrieta and her family, and she’s documented the whole journey on her blog. We spoke to the blogger to learn more about how she created such a stylish space without sacrificing practicality. I’ve always been attracted to design in general, but different seasons of life brought about different things. I was at a salon for eight years, where design is interpreted more [through] beauty. But once I had kids and decided to stay home, I still had that need to be creative, and it translated into designing spaces. When I was young, my mom was very into design, choosing styles that I didn’t think were necessarily the coolest as a kid; we had a lot of rattan, and none of my friends had rattan! It’s so trendy now, but as a kid I was like, ‘how come no one else has it in their home?’ [She] also had a lot of plants that me and my siblings hated, but as an adult I think it’s influenced me a lot. They create a very casual, welcoming home—they bring life in. You’ve done some pretty extensive renovation work; was there a space you found the most challenging? Probably when we were creating a wall for the fireplace. It was a traditional brick fireplace and we wanted to make it more modern, so we basically hid the brick and pulled it out so we could fit the TV. [Then] I had to figure out a way to make the TV not the focal point; by creating the built-in bookshelves on either side, I felt like it helped mask the big old television. Where did you look for style inspiration when coming up with the design of the home? I definitely am influenced a lot by a few designers in particular; currently, I look a lot to Studio McGee and Amber Interiors, and I love Chris Loves Julia. There are things they create that may be a little too put together for someone with four kids, but I’m definitely influenced by them. Was your California background another source of inspiration? How did your surroundings influence your design? Things are green, everywhere you look. Even in the months when it’s dry, I still love how it looks outside. This is weird, but I love when the hills have dead grass. I love the colors and the contrast between the sky and the dry neutral hills. Speaking of neutrals, how did you approach adding interest to your home against a more subtle color palette? I don’t personally like to do a lot of color, so I rely on textures—I love using wall treatments. Our house is very simple, with lots of clean lines, so how we incorporate interest is [through texture]. I don’t have a farmhouse obviously, but I love using shiplap. Even wallpapering; that adds interest and texture. And of course, pillows; your couch can be a piece of art. Just switch out your pillows. Can you tell us about the sculptural statement lighting you used throughout? An easy way to make anything interesting is via the light fixtures you choose. For me, I definitely wanted my house to feel casual and inviting, which is why I chose brass. It adds that warmth. You can make it interesting with the shape and the size of what you choose. My house isn’t mid-century, but we have mid-century pieces from Hudson Valley in the kitchen that are a little unusual, but [still] blend in. How did you design a home that’s both adult and kid-friendly? It’s all about multifunctional spaces. We used to have an office in the back [of the house], but we opened the living room wall so that’s now our office but also our playroom and game room. Do you have a favorite part of the home? Probably the entrance. I feel it’s very inviting, and you can see a lot of our home from there.